You can blame Krishnan's Dairy for Sharu still being with us. 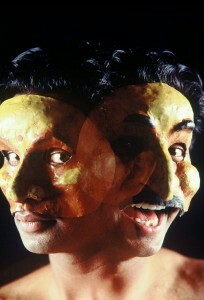 Jacob Rajan, the master of masks. When my husband Tim and I moved here almost 10 years ago Krishnan’s Dairy was the first live theatre show we saw. It not only left an indelible memory of theatre at its best but it was one of the key motivations why we decided to stay in New Zealand. Having come from the hustle and bustle of Hong Kong we did not know whether there would be enough around to satisfy us as culture vultures. Indian Ink Theatre Company’s original ingenious production allayed those fears and made us feel we could live here and make a go of it. So going to see the show this time around was an experience that was approached with much excitement but tinged with trepidation. ‘What if I don’t like it as much as I did the first time?’ I thought to myself. Also I was a little dubious about spoiling the sweet memory in case my taste had changed a decade later. But I must admit that the minute the house lights went down and Jacob Rajan and musician David Ward started strumming on stage all the fabulous warm fuzzies I felt a decade ago came flooding back. Rajan, who plays the dairy owners Gobi and Zina, is extremely deft with his mask work – with his slight of hand he slips seamless from one character into another. I was pleasantly surprised that the whole experience was even more captivating than I remember. His ability to change the pitch of his voice and the swiftness and subtlety of body language was exquisite. This was further heightened by the way he made the repartee between the two characters seem so completely effortless. 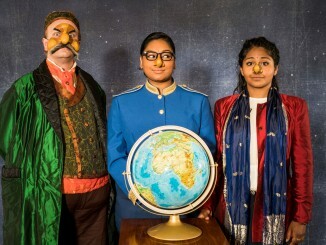 It’s of course no surprise that Krishnan’s Dairy launched Indian Ink Theatre Company in 1997, winning Production of the Year and then going on to win a Fringe First Award at Edinburgh. 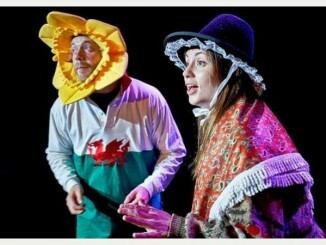 Today the play is taught in the secondary school curriculum and in University courses. Krishnan’s Dairy has also been published by Victoria University Press. It is part of the ‘Indian Ink Trilogy’ which includes their following works The Candlestickmaker and The Pickle King. But I’m sure you know all that already. 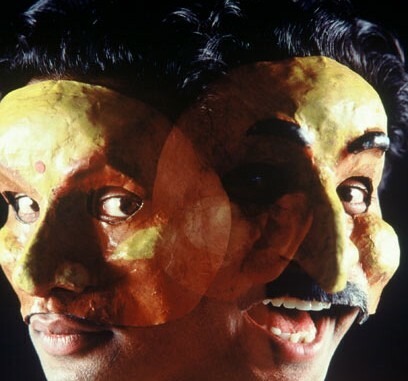 Besides being the consummate actor with impeccable mask skills, Rajan’s comic timing was something I still found absolutely breathtaking. Something I didn’t expect to feel, having seen it before. The precision of his hand movements with the sound of the till and his body movement every time it opened was bar none. It’s therefore not surprising that co-writer and director Justin Lewis said in his after party speech that over the past 15 years Rajan has spent the equivalent of 8,760 hours performing Krishnan’s Dairy on stage – which must be a record for New Zealand theatre. Having seen their more recent work Guru of Chai as well, it is great to be able to look back at the trajectory of how Indian Ink Theatre Company has become what it is today. Although the idea of Krishnan’s Dairy is a lot simpler than the multi-layered plot of Guru of Chai, I still believe it works and is a brilliant piece of Kiwi theatre that has indeed withstood the test of time. Krishnan’s Dairy is presented by Indian Ink Theatre Company and plays at Q until 4 Aug. More details see Q.